I’m working on an article about the work I did at Greenham Common for my MSc. Well, I’m actually working on two; one ‘results’ publication, for a more straightforward journal, and one ‘theory’ piece for a more radical journal. The latter is due very soon so is the focus of lots of meetings and writing and re-writing at the moment. I’m really excited about it and I promise to post links as soon as I can. For obvious reasons, I can’t post the draft here! What I did want to do is talk about something that is going in it. Lola hung on and Lavinia showed her. ‘Tuned in to what?’ said Lola. ‘Everything,’ said Lavinia. She took Lola hunting with her and Lola got tuned in. Ah!’ said Lavinia, clicking and buzzing, sweeping the night with her scanner and rolling with the rolling world. ‘Ah!’ said Lavinia, tuned into everything. This story has always been a strong metaphor in my life for my relationship with my mum, how she passed on to me the joy of being alive, being female, being powerful and strong. That zen-like moment of rolling with the rolling world. ‘Passing the something to the other’ (another line from the book) is our private code, if you will, for that intuition, that sense of belonging and knowing. It is an amazing gift. She recently dug out the book (it’s not being thrown away, EVER!) to get the above extract for me so we can quote it for the article, how amazing is that? I’m so excited to be working on something so personal and meaningful amidst all the positivist peat bogs! I’m also really grateful to my colleagues on the project for being willing to be so brave and open about our emotional and personal connections to Greenham. Us women rock, no? Hoban, R & Baynton, M 1984. 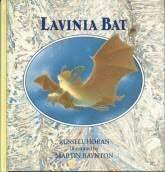 Lavinia Bat. Walker Press Ltd, London.